Bajaj V15 can be undoubtedly called as the most successful motorcycle in the recent times. 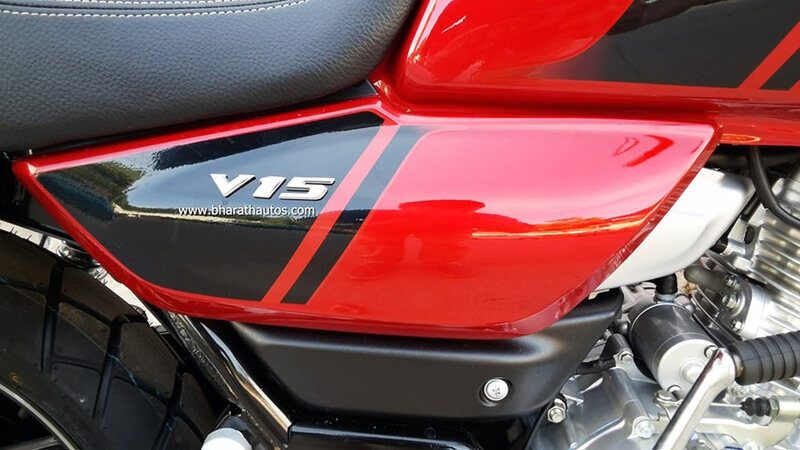 With the growing popularity of V15, Bajaj has now introduced a new color – The Cocktail Red Wine Color. When launched Bajaj V15 motorcycle was launched in the Indian market in only two prominent colors -Pearl White and Ebony Black colour schemes. The Pearl White livery for the Bajaj V had the front fender, headlamp housing, fuel tank , side panels, and rear cowl painted in white and red coloured decals decorating the tank and the side panels. Ebony Black version of Bajaj V15 replaced the white paint of the Pearl White colour scheme with Black while the red decals remaining the same. The Cocktail Wine Red Color of Bajaj V ( Which you see in the pictures) was spotted near a dealership at Mangalore, Karnataka. The Cocktail wine red color is nothing but an inverted version of Ebony black color of Bajaj V. The fender, side panels, fuel tank, headlamp housing, and the rear cowl gets the deep dark shade of red and the featured decals are in black. 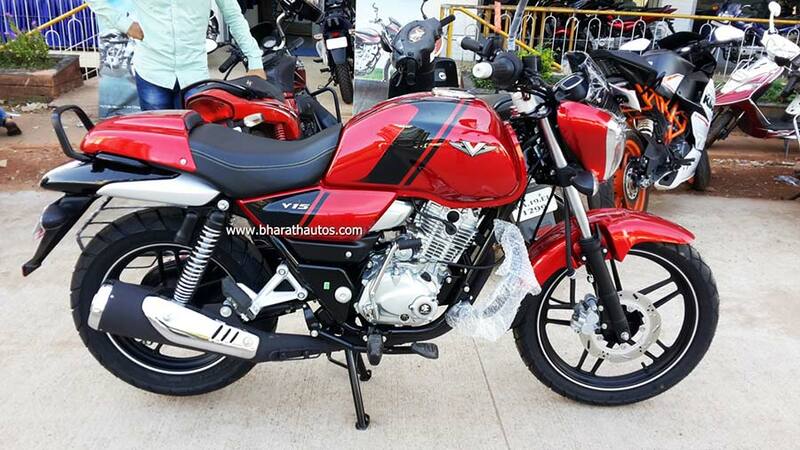 There is no word if there is a change in the price of Bajaj V with this new color. In the other news, Bajaj had introduced a Desert Gold edition of the Avenger Cruise 220. The Bajaj V is powered by a single cylinder, 4 stroke, SOHC 2 valve, Air cooled, DTS-i engine. The 149.5cc engine churns out a maximum power of 11.8 Bhp at 7,500 rpm and a peak torque of 13 Nm at 5,500 rpm. The power id pushed to the wheels by a 5-speed transmission. 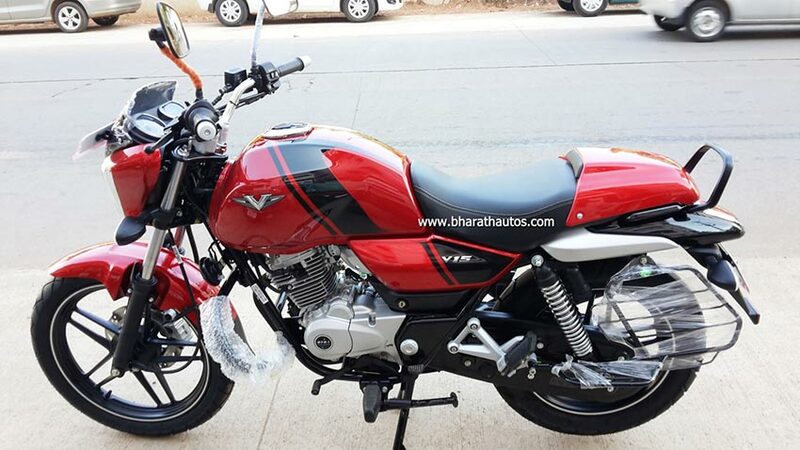 The new Bajaj V retails for a price at INR 62,002 (Ex-Showroom Delhi).